It's time for our seventh story feature event! The two stories featured in the last event will now be unstickied. The record for most stories updated was broken again this session! 57 stories are active on Boolprop! Amazing! To celebrate, there's 4 features this week! As Far As the World Goes (AFATWG) is the story of a whole town, generation after generation. Some lead fairly normal lives, others are meant for greater things. 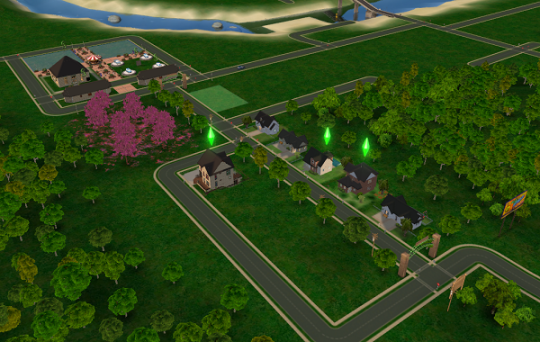 A Sims 3 Story: Click here to read! A: I’ve played TS1, and TS3 since the release date. I know about Boolprop via medleymisty who mentioned it. A: Krisis by Valpre was among the first stories I read, and I loved how her screenshots were so detailed, with a story full of twists. Later on, I read Kaleekalo’s Desperate Sims and I was hooked. She really is my role model. Q: This is quite a big, ambitious project! What is your favorite thing about your story, that just keeps you going? A: I can’t help it, I just enjoy imagining what will happen next. The variety of the families make it that I’m never bored, there’s always a plotline somewhere that I want to develop. I also love when the game surprises me with unexpected interactions. It’s like my characters were alive. Q: Have you already planned out how your story will end? A: Yes, I had to. Because I don’t think I will be able to play and write for that long anymore. It really takes me a lot of time, and there may be other RL priorities in the future. But I fully intend to go through it to the end. I have a plan. A BaCC challenge - attempting the impossible. A Sims 2 BaCC: Click here to read! A: I started playing sims when I was around 10 years old. That's a good 11 years ago! I briefly played the sims but immediately switched to the sims 2 when it came out. The game had me hooked from day 1! I first heard of boolprop through a pen-friend I had met on the sims 2 exchange website. She highly praised the community and stories available to read, so I decided to join (back when boolprop was still a .com!). A: I read a lot of sims stories. I especially love stories with plots, but I have never had enough patience to go beyond documenting what happens to my sims (with a few twists here and there) which is why I decided to take up a challenge type story. I've always loved reading BaCCs although unfortunately, I've never come across a completed BaCC! Two stories that greatly inspired me to start this BaCC were Maranatah's Clayfield BaCC (still being updated) and romysims's North Witchwood (discontinued). Q: Are you ever intimidated by the huge scale of the BaCC? A: Yes! A million times yes! But that's what makes the challenge even more fun! That and the fact that gameplay is always changing since you're shifting from one family to the next and unlocking stuff as you go along (according to the rules you follow). Elwood Rose is my second attempt at a BaCC. I had to abandon my first one due to computer troubles. I really wish to complete this challenge someday but since this is such a vast and complicated challenge only time (and the support of my computer) will tell! Q: What's your favorite thing about playing in rotation, rather than one family for a long time? I love how it spices up the gameplay! One minute you're playing the family with 10 kids, the next you're playing a divorcee who's romancing half the men in town and then you're handling a werewolf who wants nothing more than to be a good father to his kids. It's one huge exciting adventure! Q: Who is your favorite Sim in your BaCC? Either my founder, Ethan Turner, or my newest CAS Sim, Finnley Underwood, who may or may not be murdering every single person that contributes to his Woohoo with 20 People LTW. Here is where a special shout-out to the challenges that were completed this week would go!! Finish your story or challenge and you'll get a shout-out here!